The Trump economy is moving forward, with new GDP numbers being released on Friday next week. With a 2.9-percent annual growth rate in the second quarter, we should expect a third quarter above three percent. 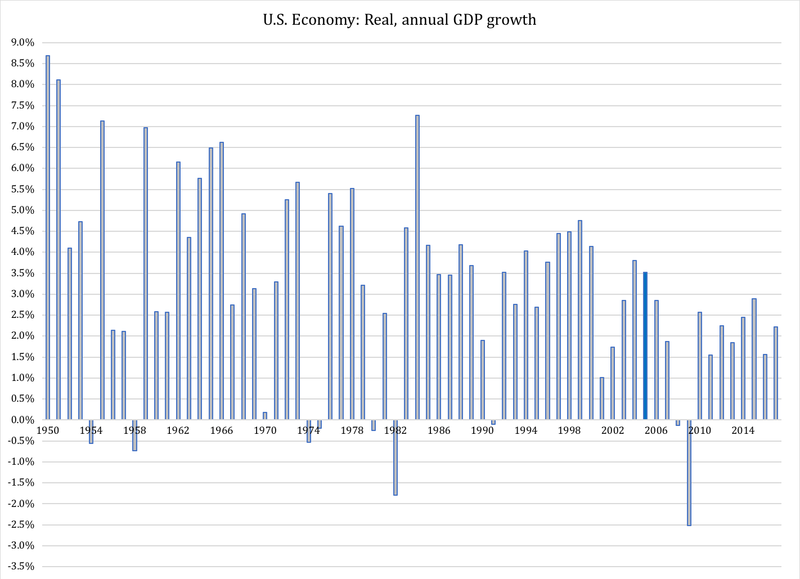 In fact, if this is the case we could see the first calendar-year GDP growth rate above three percent since 2005. It would be nice to get back to three precent growth as the normal pace of the economy. We have not been there since the 1990s; the Obama presidency was a lost eight years, even counting in the fact that he started off in the depth of the Great Recession. His fiscal policy was entirely centered on growing government, although his budget impasse with a Republican-led Congress actually made for a tolerable compromise of bad intentions. The really bad part of Obama's economic policies was his barrage of regulations that fractured the economy and squandered a strong recovery. Trump's deregulation campaign has combined with a strategic cut in corporate income taxes and given us a shot at returning to good GDP growth rates. So far, so good. In addition to a trajectory back to 3+ percent growth, the month of September saw the lowest unemployment rate since 1969. Thanks to an increasingly strong economy and basically full employment, the federal government is collecting an abundance of tax revenue. We have many reasons to be happy, don't we? Yes, but as surely as a Republican-led Congress and White House can actually do something right on occasions, they can also screw things up in a heartbeat. Or a fiscal chest pound. In the midst of this strong economy, Congress is fast-tracking its budget back to trillion-dollar deficits. This should not be happening. For sure, we have had budget deficits almost uninterruptedly for half a century, with four short years on Clinton's watch when the federal government ran a surplus. However, that actually makes the very point: Clinton presided over an economy that grew in excess of four percent per year for his entire second term. This allowed him to become the only president in half a century with budget-surplus bragging rights. His recipe was quite simple. First, try keep your fingers away from the economy; Clinton was not nearly as bad with taxes as he is sometimes portrayed, and his regulatory incursions were no more serious than those of any other recent president. From an economic viewpoint, he was not excellent, but good. Secondly, when the economy is operating at full capacity, don't go out and spend a lot of money. Democrats handily beat Republicans on fiscal conservatism. In fairness, Obama's restraint on spending was not for lack of trying. The only thing between him and a spending blowout was the GOP majority on Capitol Hill. Obama's resentment for compromises with Republicans in Congress was the only thing bigger than his desire to spend more money. As a result, continuing resolutions froze spending levels in a way that no statutory budget limitations could accomplish. The Trump 1 number is, of course, a forecast for the entire period 2017-2020. It remains to be seen if this number will hold; he has directed his cabinet members - except the Secretary of Defense - to find five percent cuts in their agency budgets. Unless a miracle happens, this is not going to be a genuine five-percent cut. It will, plain and simple, reduce spending by a nickel on the baseline dollar. The baseline, as we all know, is the trajectory of spending growth that Congress has defined as "zero growth spending". Think of it as you and your family deciding that unless you can grow spending by, say, six percent per year, your spending is actually shrinking. In other words, if you spend $106 in 2019 for every $100 you spent in 2018, you have not grown your spending; if you spend $105 in 2019 for every $100 you spent in 2018, your spending has gone down. Yes, this is literally how baseline budgeting works in the Beltway Swamp. Is it any wonder they don't know the beginning and the end of fiscal conservatism? Sadly, there is a serious side to this. In times of record growth, record employment and record tax revenue, Congress should not be borrowing a dime for its spending. It should be paying down its debt. Instead, it is en route to blowing through the $4-trillion milepost in 2019. In 2023, the annual federal budget will reach $5 trillion. There is only one solid solution to this spending feast: serious, structural reforms that gradually phase out the welfare state. The very definition of the welfare state is to put the federal government in the business of economic redistribution. So long as it remains there, Congress will have to increase spending regardless of how well the economy is doing. 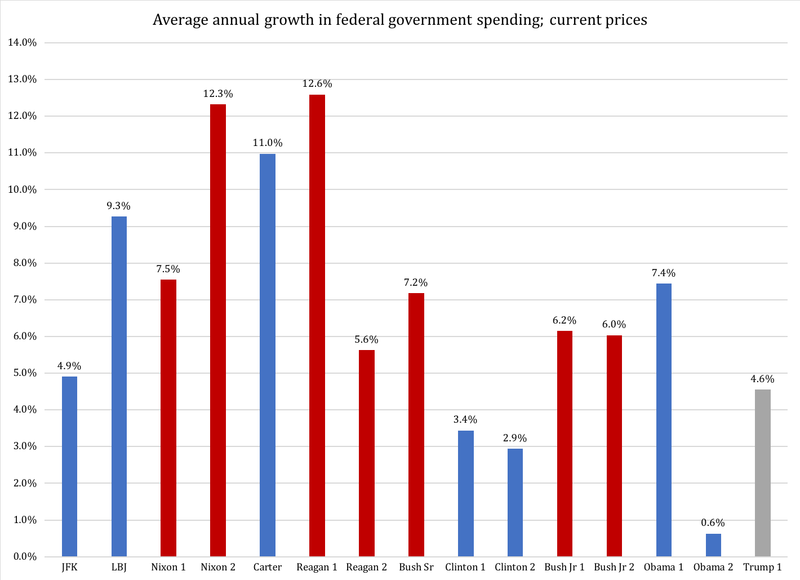 When the institutional goal of the federal government is to eliminate economic differences between Americans (and that is indeed the goal of our welfare state) entitlement spending will continue to grow until, literally, there are no economic differences anymore. Such monumental reforms, however necessary, will not happen in a heartbeat. Not even in a presidential term. We might get started on them under a firmly committed two-term president, but until that happens it is time for Congress to revisit its own spending restraints. The easiest way for them to do this is to go back to some sort of statutory spending control. That is not going to be easy, given that they have thrown out the debt ceiling (formally suspended - don't expect it to ever return), done away with the sequester (a stupid idea but better than nothing) and eliminated the IPAB spending-control board in Medicare (never active but at least an institutional marker of spending restraint). Still, it might be worth trying another statutory model. The Swiss debt brake comes to mind. Time is running out, though. 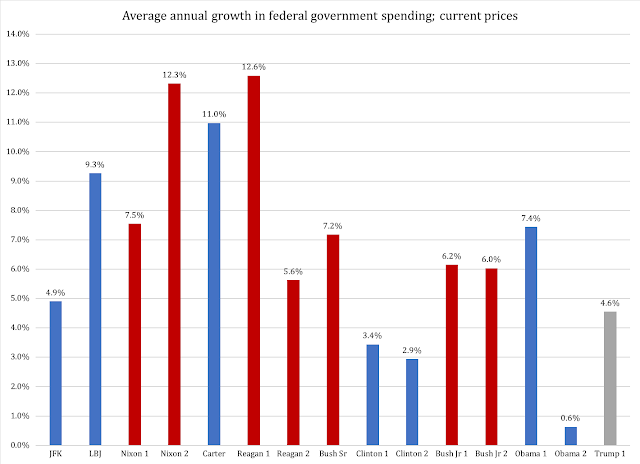 Not only does the Office of Management and Budget predict that Trump will trump Obama and Clinton in spending growth, but they also forecast that over the next few years the federal government will pay for 17-22 percent of its spending with deficits. Imagine that. The economy is doing better than it has in almost three presidential terms, unemployment is so low you need a macroeconomic magnifying glass to find it, tax revenue is roaring in, and Congress is not even thinking twice about letting our kids and grandkids pay for two dimes of every dollar they spend. This is fiscal recklessness of a kind that hurled countries like Greece, Spain and Portugal, as well as Puerto Rico, into deep debt crises. We are heading in the very same direction, and Congress is running out of time to stop it. In lieu of structural spending reform, the Swiss debt brake could at least slow down the madness. As structural deficits have come to replace cyclical deficits as the dominant kind of fiscal shortfall, credit has de facto become a permanent funding source for government funding. Given that borrowed money is an unsustainable funding source, the question is what measures are needed to end budget deficits. While the European Union has failed in applying a constitutional budget-balancing measure, Switzerland has had some success using a regulatory measure focused on the debt instead of the deficit. While the experience is not unequivocally positive, it is promising enough to be a good example for what type of budget-balancing regulation the United States could have use for. I also pointed to GDP growth numbers showing that Switzerland had seen a nice bump in economic growth after the debt brake went into effect. The debt brake would have to be modified to fit the U.S. institutional structure, but it is entirely doable. It would be a first step toward putting a leash on a runaway budget; it is not good enough to permanently solve the federal deficit problem, but it would buy us valuable time for more serious reforms.